Bringing together musicians from diverse regions of the globe to create new music is a great passion for The Awakenings Ensemble’s leader MICHAEL PIGNÉGUY. Capturing the unbridled energy of live performances in Australia and introducing the wizard-like production knowledge of cutting edge producers, then inviting international guests to spend time in the studio, culminated in the release of the debut album SPEAK. The CD was recorded in Doha, Dubai, Melbourne and Perth, the musicians who open their souls through the music, hail from Australia, the Ukraine, Lebanon, Tunisia, England, Syria, the USA, Italy, Canada and Egypt. Finding the ‘Lingua Franca’ to work together was not without some challenges but it’s obvious a huge amount of fun was had along the way! Part of the commonality between the jazz and oriental artists was the emphasis on improvisation and the strong rhythmic drive of both forms of music. Two essentials for Michael as a composer and as a performer. Where jazz favours the melodically adventurous, Arab musicians also excel at the crafting of endlessly interesting phrases with unique ornamentation. The way this music is presented to you on the album is primarily through the vision of Australia based producer Trilby Temperley, a long time collaborator of Michael’s. Although skilled in totally different areas Michael and Trilby share core musical values and their blend of tastes brings an up to the minute freshness to the project that floats above deep musical foundation. Creating ‘The Awakenings Ensemble’ first seemed relevant as the immense changes across the Arab world began to take place and some of the music on the CD has been influenced by specific events during this time. Other pieces were conceived years before these social, political and cultural developments but share a certain commonality and appear on this disc for the first time. The idea of an ‘awakening’ can also have a much more personal and less definable meaning, particularly in the world of arts and music. It is here, where the path between these two areas intersect and where the music of The Awakenings Ensemble takes flight. ​Also noted on this page are contributors from the ever growing list of artists that take part in The Awakenings Ensemble, both live and in the studio. Yassine was born and raised in Qayrawan, Tunisia. He became well acquainted with the Arab-Andalusian musical traditions at an early age and started to play the nay when he was 12. The performance practices of the instrument led him to develop a great passion for the Andalusian style and essentially prompted interest in other closely related traditional and Western musical cultures. Yassine pursued music at the Higher Institute of Music in Tunisia and obtained his Diploma in nay performance of musicology. Yassine has led a life as both ethnomusicologist and performer ever since. He became a member of the Tunisian National Orchestra and worked with the most renowned Arab singers. In 2003, Yassine enrolled in the ethnomusicology programme at the Sorbonne University where he obtained a M.A. in ethnomusicology and is currently finalizing his PhD studies. In France, Yassine explored various other styles of music, including electro-acoustic ventures which provided him with an opportunity to obtain knowledge in computer-assisted music, recording, sound design and synthesis, and mixing and mastering techniques. 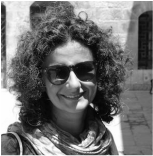 A native of Syria, Bayan attended the Higher Institute of Music in Damascus specialising in ‘ud and voice. True to traditional forms, he performed regularly with the most prominent Syrian groups as singer and ‘ud player and directed various Arab vocal ensembles. Bayan has been teaching for many years and follows the old school of teaching ‘ud and voice and is acquainted with both traditional and contemporary vocal and instrumental maqam repertoire. Dmitri Torchinsky was surrounded by music from a very early age. His father was the leader of the Bolshoi Theatre orchestra and his mother was a flute teacher. He started to play the violin at the age of 5 under careful guidance of the best teachers, curators of the Russian violin tradition. At the age of 14 Torchinsky left Moscow and attended the Purcell School of Music and the Royal College of Music in London as well as the Universität für Musik und darstellende Kunst in Vienna. Having won several violin competitions, he enjoyed a busy international career as a soloist, chamber and orchestral musician, before joining the Qatar Philharmonic Orchestra and the faculty of the Qatar Music Academy. Victor Sumenkov started playing violin at the age of four. In 2002 he completed a Master of Music Degree in viola performance at the Novosibirsk State M. I. Glinka Conservatory. He continued his education in Germany with Professor Matthias Buchholz, entering the Hochschule für Musik und Tanz Köln, where he won the famous German scholarship of the German Academic Exchange Service (DAAD). Victor has won two international competitions in Novosibirsk and Krasnoyarsk. In 2004 Victor received the Yehudi Menuhin Foundation Scholarship. In 2007 he took the audition for the emerging Qatar Philharmonic Orchestra and won the sub-principal viola position. Since August 2008 Victor has been part of the Qatar Philharmonic Orchestra and more recently a viola teacher in the Qatar Music Academy. As a young musician with vision, Mr. Ng gained his orchestra experiences step by step, from his hometown’s Penang Symphony to the Malaysian National Symphony as Principal Timpanist, and from the Asian Youth Orchestra to the Jeunesses Musicales World Orchestra. Born in 1980, Mr. Ng was into the popular music scene as a guitarist and keyboard player, composing songs for gigs before he went for further studies in Munich and Rostock. Under the tutelage of Torsten Schönfeld, Dominic Oelze, Mathias Müller, Edith Salmen and Adel Shalaby, Mr. Ng received his Bachelor and Master degrees for Percussion at the Hochschule für Musik in Rostock, where he was awarded the Horst-Rahe-Stiftung scholarship. After winning the Gasteig Soloist Competition and Hochschulwettbewerb for Duo and Trio in Germany, orchestral playing, teaching, CD recordings, solo concerts with orchestras were among his most important activities before he joined the newly-founded Qatar Philharmonic. Jeremy Greig is a trombonist who graduated in 1995 with a Bachelor of Music from the WAAPA Jazz department, in which time he was a regular member of WAYJO, WAYO, The Perth Jazz Orchestra, and Jazz West Big Band. After moving to the USA in 1997 he completed a Master of Music in 1999 from the University of Miami. During this time he performed and recorded in a group with multi-instrumental legend Ira Sullivan, known as the Inter/Outer Continental Quintet, with which he attributes as "the greatest training ground anyone could have." It was during this time that he received various Downbeat magazine awards, including Outstanding Jazz Combo performance (1999), Best Big Band - University of Miami Concert Jazz Band (1998) (1999), and Outstanding Big Band Performance - University of Miami Studio Jazz Band(1998) (1999). 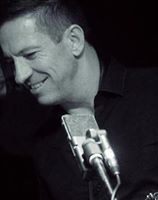 In 2003 he toured regional WA with Country Arts on "Simply Sinatra" featuring vocalist James Flynn. Performers that he has worked with include international musicians such as Maria Schneider, Jimmy Heath, Wynton Marsalis, Mannie Albam, Bob Mintzer, Dave Liebman, and Rick Margitza. Jeremy works as a freelance musician playing in various musicals, a 20th Century ensemble known as The Collective, and is a regular member of the Hip mo Toast Big Band and the latin band Descarga. He currently works as a lecturer in Jazz and contemporary music teaching improvisation, Big band, theory, aural training, and takes various ensembles. This soulful and versatile saxophonist is renowned for his hard-hitting, swinging brand of jazz. Stylistically he draws influence from the likes of Sonny Rollins, Joe Henderson and Cannonball Adderley, to name a few. Carl has shared the stage with heavyweights such as George Garzone, Ari Hoenig, Terell Stafford and Lionel Hampton, and a long list of support performances include John Scofield, James Brown, Harry Connick Jnr and Ray Charles. Back on home soil, he can be heard in prominent groups such as fusion/funk outfit Sly, Speedball, MOE (Memory of Elements) and the Paul Grabowsky Sextet. His career highlights include being a finalist for the prestigious Freedman Fellowship in 2007, performing at the Villa Celimontana Festival in Rome (2006), performing at Ronnie Scott's in London (2012) as well as his many tours to New York, Europe, India, Cambodia and many more. After decades of being a prolific recording artist as a sideman, he finally delivered his first, eagerly awaited offering as a leader, "11:11" by his quartet featuring the talents of Sam Anning, Tom O'Halloran, Pete Jeavons and Ben Vanderwal to much acclaim. This in demand saxophonist can be heard frequently gracing the stages of Perth with the scene's best, as well as lecturing at the highly regarded West Australian Academy of Performing Arts. Composer and guitarist Enrick Adam was born in Paris in 1975. Based in London, he composes music for film, dance, and theatre. He started his music education at the age of eleven and later joined the guitar and Jazz workshop at the local conservatoire. Playing professionally at eighteen, Enrick performed with many bands in Paris and thus accumulated much early live experience. These various projects allowed him to compose and perform in many styles of music such as jazz, orchestral, rock, ethnic, electronic and popular music. From jazz trio to electronic percussion quartet, soul outfit to symphony, Michael has composed and produced music for a broad range of musical settings in many countries. Shaping his music, Michael draws on a diverse career as a performer, composer and arranger having created music in the realms of jazz, funk, hip hop and pop through to chamber music and orchestral. Known for his ability to blend styles Michael is in high demand by pop artists particularly when translating music to the orchestral realm. His compositions and orchestral arrangements have been performed by orchestras throughout in the US and Australia. His own groups such as The Michael Pignéguy Sextet and Salamander have performed in the US, Australia, Italy the UAE and New Zealand. Multi award winning music producer, Trilby was born In Toronto, but grew up in Australia. He has led groups such as A.R.G. (Audio Response Group), Cloud Kollektiv and Universal Tone Arm. He has been commissioned by pop and jazz artists through to dance companies to bring his unique vision to diverse projects. Trilby co-produced SPEAK with Michael Pignéguy and has worked with Michael on many other projects. As an audio and music technology specialist Trilby's advice is constantly in demand. He also an avid photographer. Featured vocalist on The Awakenings Ensemble's first single from the group's forthcoming second album, Aysha's sensual and soulful voice is the perfect foil for the groups Neo Soul track Just Out of Reach. Aysha is known as the leader of popular WA group the Amani Consort and this collaboration with The Awakenings Ensemble shows the breadth and flexibility of her musical talent. From Syria, George has been passionate about percussion throughout his life and started to formally learn percussion at a very young age. He pursued music at the Higher Institute of Music in Damascus specializing in traditional and Western percussion. Trained under renowned Russian Professor Alexey Artimiv, Turkish Master Ahmet Misirli, Professor Jean Luke in France and Djembe Master Ian Maller in the U.K., George explored various extended technique methods on various traditional and Western percussion instruments, including the split-finger technique on the Arab tabla and Djembe. George Oro’s passion towards traditional and Western percussion instruments gave him an edge and thus enabled him to be part of diverse sets and perform all over the world both as part of the percussion set and soloist. Geroge is well-recorded and a member of several chamber groups including Maqam, Jsoor, Percumania and Notta. Since 2000, MAias has performed and shared his music all over the world with many top artists and orchestras like: Gidon Kremer, Danial Barinboim, Dave Pierce and Kremerata. MAias has a Master Degree from Vienna University of Music, majoring in Violin performance. During his studies he won the Competition of Vienna University of Music, and participated in the international Paganini Competition in Italy. In 2006, MAias established the ensemble MAqam in Vienna, specialising in classical Arabic music. The ensemble has performed more than 200 concerts in 22 countries. MAias has made many solo recordings for film music, music bands, live theatre and TV shows soundtracks. Oleg Polyanskiy is a Ukrainian pianist, teacher, composer and arranger. He was born in Kharkov, Ukraine, and studied music in the conservatory and music university of Kharkov. After graduation, Oleg worked in a music university and went on to win awards in several international competitions and festivals. He has performed around the world in countries such as Ukraine, Russia, France, Turkey, England, Qatar and the UAE, and has had the privilege of sharing the stage with many renowned musicians such as Ray Coussins (Frank Sinatra’s pianist); Tempei Nakamura (acclaimed Japanese pianist-composer); leading Ukrainian progressive rock bands Sunchild and Karfagen; premier symphony orchestras of Ukraine; and Qatar-based multi-national bands such as Doha Jazz and The Awakenings Ensemble. Born in 1979, Matteo Gaspari started studying music at the age of 8. First he learned Piano, then Accordion and eventually Double Bass. He graduated at the Conservatorio di musica di Pescara with Prof. Giancarlo De Frenza and afterwards he moved to Germany to study with Professor Wolfgang Güttler at the Hochschule für Musik in Karlsruhe. There, before graduating, he was member of the double bass ensemble, Geatles. Matteo attended several master classes with well-known double bass players such as Dorin Marc, Giuseppe Ettorre, Antonio Sciancalepore and Miloslav JelÌnek. Matteo Gaspari won 3rd Prize at the Corrado Abriani string competition in Milano in 2001. Since 2008 he has been a member of the Qatar Philharmonic Orchestra. A dynamic performer from an early age; her passion, curiosity and energy has taken Cat on an intriguing musical journey. Cat developed her talent as a student at the Associated Board of the Royal Schools of Music, becoming a solo flutist and singer. As a professional musician Cat has worked with an array of talented and experienced musicians and producers in all genres of music, both in studios and live. She has performed classically with orchestras, singing live jazz in duos, trios and quartets. ​In December 2012, Cat toured with Demis Roussos as his backing vocalist and flute player during the South African leg of his world tour. Noura Sedaka is a unique artist and talented performer. As a musician she has performed in jazz settings and with The Awakenings Ensemble she co-wrote Children of Change (lyrics in Arabic). She has also written lyrics for Dark Days (aka Leaving Syria). Surprisingly Her background is in economics (Master's Degree from La Sorbonne) while she also spent many years in career theater and arts. When not touring with pop Australian singer-songwriter Pete Murray, O’Halloran leads this original jazz piano trio outfit and also conducts orchestras from time to time, composes new classical music, plays wild old analogue synthesizers and even rock guitar. He completed a Master of Music (classical composition) at the Sydney Conservatorium of Music with Trevor Pearce and Michael Smetanin as supervisors. He was a finalist in the Freedman Jazz Fellowship at the Sydney Opera House in 2003, and received the WAAPA Bob Wylie Jazz Scholarship in his 2nd year of study. He was also accepted into the National Academy of Music’s Improvisors Programme in 1998 in Melbourne. Performances have taken Tom to Rome (Celimontana Festival), London (Covent Garden, Royal Opera House), LA, New Orleans, Auckland, Vancouver, Canada, the 2007 International Association of Jazz Educators Conference, and shows in New York, Houston, Miami and Virginia. Studied classical piano, and then saxophone, pipe organ and the electric bass. 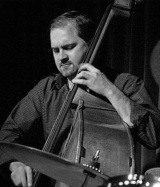 Bachelor of Music in Jazz performance on the doublebass at the Western Australian Academy of Performing Arts (W.A.A.P.A), where he is now a staff member. Pete also studied with visiting jazz giants Ira Coleman, Rufus Reid, Niels Pedersen and Ernie Watts and was awarded the Kosmic music prize for the best graduating student in his year group. 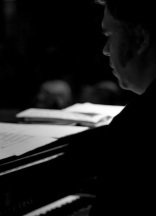 In addition to The Jamie Oehlers Quintet, Graeme Lyall, Elizabeth Sanderson and The Western Australian Symphony Orchestra (W.A.S.O), Peter has performed with internationally recognised jazz artists such as Geoffrey Keezer, Danny Moss, Don Burrows, Dale Barlow, Andy Sheppard, Dave O’Higgins, Clare Daly and Michel Legrand. Chris Coull is known for his tasteful and inventive musicianship on both Trumpet and Flugel horn. He is also the leader and driving force behind the Doha Jazz organisation which books in excess of 300 jazz gigs a year in the region! Chris and Michael Pignéguy co-produced the very popular Doha Jazz debut CD entitled Blues on the Corniche. Chris's efforts have seen all proceeds from the sale of this CD go to Cancer Research UK with well over 120,000 QAR being raised so far.